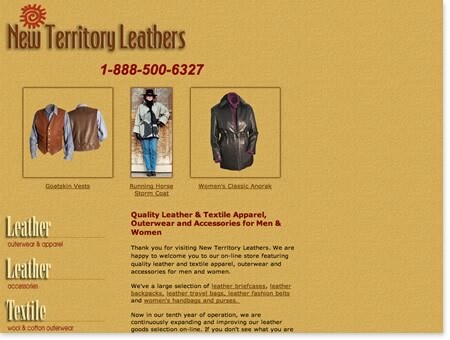 New Territory Leathers is a 3rd generation site for us, meaning, we have designed and built it now for the 3rd time. . This client has been marketing with us for about five years. He does a little paid advertising via pay-per-click campaigns, but enjoys excellent natural rankings for general terms like 'mens leather jackets' and 'mens shearlings'. 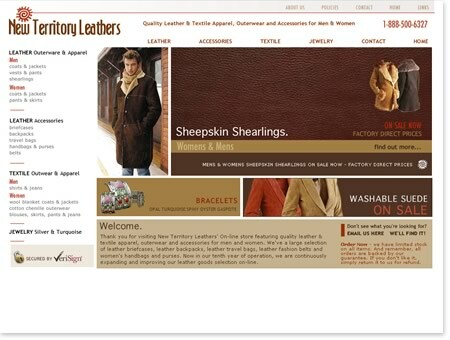 He has consistently out-performed leather stores with much bigger marketing budgets. He has owned a bricks-and-mortar store for many years in several different locations. Over 70% of his overall sales this past holiday season came from his ten year old website and prompted him to redesign the site. When building the site, we took special care to be sure he would attain his current rankings. The superior navigation structure and look and feel of the new site will better present quality of his products and result in greater conversions of visitors to sales.